Brockman tipped off Speed51.com to the fact that the show holds a very special place in the promoter’s heart. Thomas confirms the story and said that there was a practical reason for the ceremony to take place among racecars. “We figured if we were going to pay $8,000 to rent the building and pay for insurance, that we might as well have a party too,” said Thomas. “We got in front of DoDo’s car. At the time it had just been restored and we were seeing the first of it. Now it seems like we’ve seen it every year." There isn’t any racing in New England this time of year. In fact, this week the Northeast will be hit with even more snow as the long winter months drag on. Oval racing doesn’t start up in these parts until early April. Some regional drivers, including Scott Mulkern and Busch North driver Bill Penfold, even attended the show as fans over the course of the two day event. The popular consensus was that a good time was had by all drivers. But that doesn’t mean that race people aren’t gathering. Racing shows are a New England tradition. This coming weekend, Racearama will be held in West Springfield, Massachusetts. This past weekend, 68 racecars, many drivers and numerous fans ended up in Portland, Maine for the annual Racin’ Preview show. The show was headlined by the appearance of a large number of PASS drivers. The series had seven Pro Stocks, three PASS Modifieds and a pair of Allison Legacy cars on display. PASS drivers were also on hand to meet their fans. Among those at the show were defending champion Johnny Clark, Mike Rowe, Ben Rowe, Cassius Clark, Corey Williams, Gary Smith and Donnie Whitten. And where drivers are gathered, it shouldn’t come as a surprise that some racers were looking to gain an edge over their competition by being at the show. The camaraderie among the drivers was also a drawing point. Donnie Whitten's #83 and Gary Smith's #75 were just two of several PASS machines at the show. DoDo Brockman's Superspeedway Modified stood out in a crowd. In fact, Johnny Clark even let the fact that some of his racing buddies were in town influence his travel plans between his home an hour north and Portland. Clark appeared at the show on Friday and Saturday, but made sure that he went straight home after the doors closed on the first night. “I purposely went back to Augusta last night, so I wouldn’t get into trouble,” said a laughing Clark. In addition to the normal Pro Stocks and Street Stocks, there were plenty of other race vehicles among the 68 cars at the show. 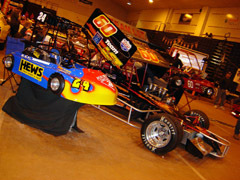 An ISMA Supermodified, racing karts and Legend cars were at the show. 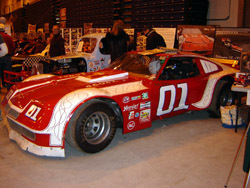 But, the most unique car at the show was probably the #01 Mustang II Super Speedway Modified owned and driven in historic races by George “DoDo” Brockman. The car was raced by Ray Hendrick until the 1978 season and sat neglected for over a decade. In the late 1990’s, Brockman traded six Busch North tires to Ray Penfold for the remains of the car and then began its restoration. By 1999, he had it on track and since then it has attracted its fair share of attention. Dirt track fans had Modifieds and Sprint Cars to look over. The show is organized by Mark Thomas, publisher of the Racin’ Paper in Northern New England. Over the past few years, the show has created its own following every February.